Classic and beautiful. 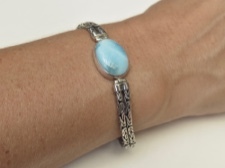 Larimar and sterling silver bracelet. 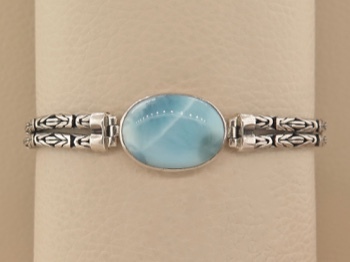 This traditional Bali design features highest grade larimar and intricately woven byzantine chains. 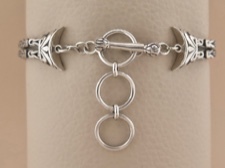 The sterling toggle closure can adjust from 6.75 to 7.25 or 7.75 inches. Each stone is unique and distinctive. 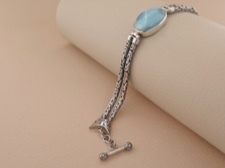 Larimar is a rare stone found only in Dominican Republic. Here at Caravan we customize every style and handpick every stone to ensure a unique and quality result we hope you will love.